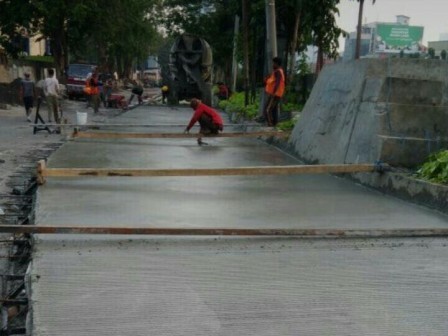 The concretization process on Jalan Pejagalan, Mangga Dua Selatan Urban Village, Sawah Besar, Central Jakarta has reached 60 percent. It is targeted to be completed by the end of September.
" It is assured to be finished this month. By doing so, it is hoped able to minimize puddles later"
Misgianto, Head of Executing Unit for Sawah Besar Sub-district Bina Marga disclosed, the concretization is a proposal of citizens to overcome the puddles when it rains. "The street itself has more than one kilometer length with six up to eight meters width," he stated, Thursday (9/14). He added, with about 20 centimeters thick, the water overflow from the water channel on the side of the road will not be inundated. "It is assured to be finished this month. By doing so, it is hoped able to minimize puddles later," he closed.